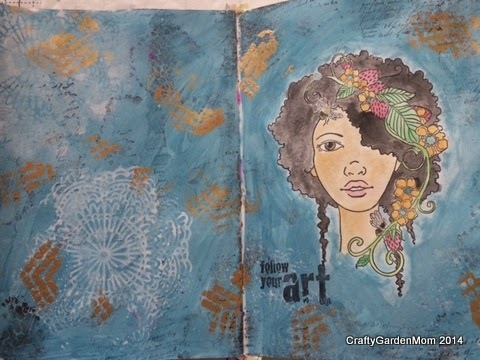 I'm showing off a few of my "sassy" art journal pages this week. And for this page I took a few extra pictures of my process and supplies so you can see how it came together. First I sketched the bum in pencil. Then, using these 3 colors, I painted in the bum area. Black pigma pen used to draw in lips, red acrylic paint to color in lips. Thursday Thoughts: "You Tube Said!" If you haven't already, you MUST take a few minutes and watch this hilarious and oh-so-true video of my new she-doesn't-know-it-but-she-is "bestie" Linda. 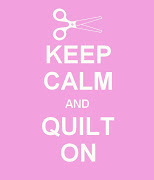 She sums up exactly what happens to me, and so many I know, after watching more than a few You Tube craft tutorials. Soooo funny...and true. LOL, my favorite part was "Tim is killing me!" Hah! Me too Linda, me too....and Moda, and Fat Quarter Shop, and Michaels, and JoAnns, and all of those places I can't keep out of but should for at least a year! I had a little time this weekend to play around with scraps and my sketchbook. I've said it many times that Fall is my favorite season, and I have yards and yards of hand dyed fabric in its vibrant colors. 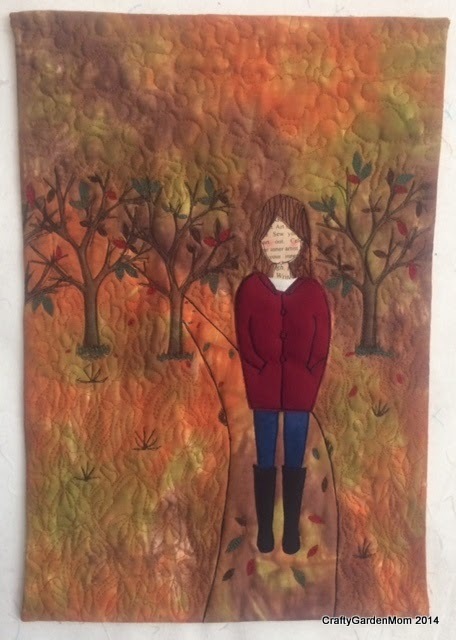 After pulling out the background fabric, I knew I wanted to recreate a scene in my sketchbook of a girl walking along a path, enjoying the crisp air and crunch of leaves beneath her feet. The I started with the trees, which are a rubber stamp. I handcut a simply girl, boots, and coat using small scraps of fabric backed with fusible web. I sandwiched the top, then did some thread sketching around the trees, girl, and made leaves with red, gold, and green thread. I usually add a caption to these mini "girl" quilts, but haven't thought of a good one for this yet. Any ideas? 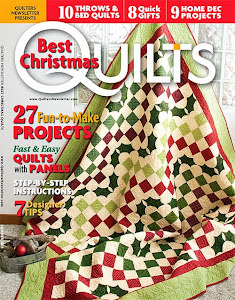 Barn Quilt spotted in Garrett County, MD during my recent book club retreat! Yes, it's been quite awhile since I did a Thursday Thoughts post. Frankly, I always have lots to say (out loud) but don't take time to jot it all down here. But we've been having a great Fall so far, and things are moving so fast (is it really almost Christmas...really?) around here, I figured I'd better take a stab at it now before the New Year creeps up on us all. I haven't had much sewing mojo the last few weeks, but recently sat down and just started fusing and cutting fabric. I just wanted to make something, no plans, no thinking it through. The rest of what happened...well we have a "what happens at the book club retreat, stays at the book club retreat" motto, so I'm sticking to it. 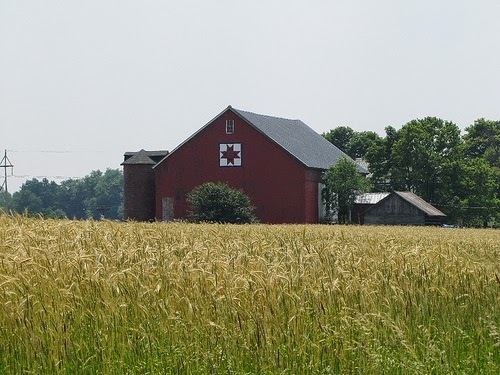 I did get to stop and take a few barn quilt pics, like the one above, while driving up to the retreat in Deep Creek Lake, MD. 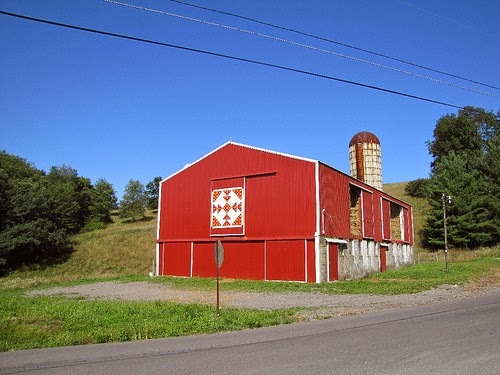 This is in Garrett County (northwest Maryland), known for having a very nice barn quilt trail. We still have plenty of activities to come this month including soccer games, dance classes, the pumpkin patch, and of course, Halloween. Maddy wants to be (surprise, surprise) Elsa, and Sam wants be...a werewolf. And that my friends pretty much sums up my kids' personalities, except if you asked me I'd switch the costumes around based on actual behavior...wait, scratch that. Isn't Elsa the one who freezes her entire kingdom including her only surviving relative because she's had enough of them? Yeah, that's Maddy alright. That's because with Christmas coming and a potential "big girl" room redo into a Frozen tundra, I know Disney will be getting plenty of my money in the next 3-6 months. and having it in my stack for over 2 years! I've heard such good things about this kids (5th-8th grade) book I had to read it myself. I'm currently about 25% in, and loving it! Think: Charlie and the Chocolate Factory except the "game" is about books vs. chocolate. Sam and I will be reading this together soon. You know how I love my (well-reviewed) historical fiction! I'm a big fan of Molly Harper, she just makes me laugh. I believe this one is only available in eBook or audio format for now. So, what are you and yours reading this month?